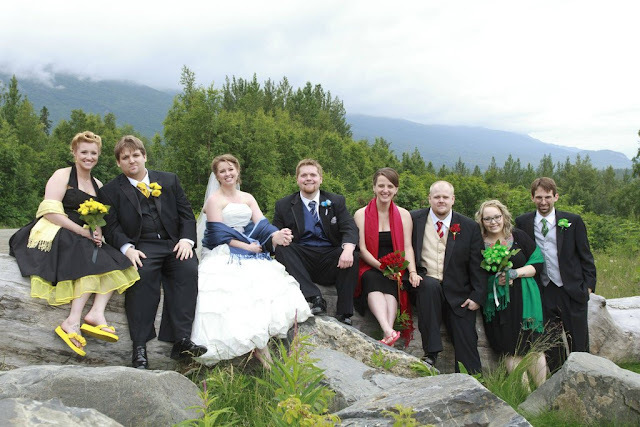 EPBOT: Gorgeously Geeky Harry Potter Wedding! Alison wrote to me today to share some pics of her wedding last month, and WOW. I think you guys are going to liiiike them! Even the bouquets were color-coordinated! I like the bottle place holders and table numbers. Ok, seriously, how'd you guys do that, Ali?! They're both Ravenclaw; see the little sigil on the tower door? And Matt is holding a D20 die behind his back! Too cute! And perhaps the sweetest detail of this Potter-ific wedding? Instead of "I do," Matt and Ali each said, "Always." Hang on, I think I have something in my eye over here. [sniffle] 'Scuse me. A HUGE thank you to Alison for sharing her simply magical wedding with us. Oh, and, guys? If and when the time comes, I think "Remus" would make an EXCELLENT boy's name. Just sayin'. Okay, this was Totally Bangin!! I love how the bridal party was a tribute to each of the houses without being literal or costumey. Jen, when and if I ever get married I plan on having a Steampunk Jedi wedding. Jedi ceremony and a Steampunk reception. Costumes will be encouraged. Bride here, wow I'm glad you liked the pictures thank you! We hung the candles using fishing line and I want to give credit to our amazing photographer Kristin Hansenshe did an amazing job capturing our day! I must get remarried! Stat! I love this! They did a great job of running the theme throughout the wedding, but not letting it become cheesy. Had to show this to my oldest son. We're reading Harry Potter together & he loves it. (Especially Hermione. Think he has a geekling crush on her.) Only up to the 2nd book so far, so he didn't get the Marauder's Map reference. Still, he thought it was very cool. Stop. I can't cry! I put makeup on, for once, and now it's going to be all over my face! I think my 12 yo daughter is now wanting to get married just to have THIS wedding. How amazing! My husband and I drove down to Orlando for our honeymoon so that we could visit Harry Potter world! Now I wish we had done something HP themed in our wedding, too! That is too cool! Congrats to the happy couple! SWOON. As for kids' names- take your pick; the books are chock-full! I especially love that a lot of the names are derived from mythological, literary, or historical figures, constellations, etc. That cake topper is awesome! If I only had the money for a Harry Potter wedding!!!! <3 le sigh. Ah, my heart just melted a little! 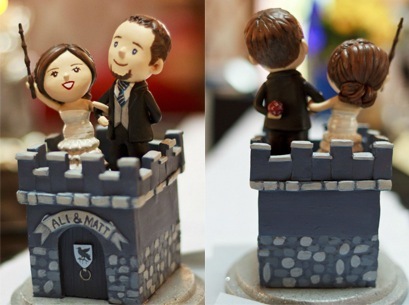 The clothes are gorgeous, and that's got to be one of the cutest cake toppers ever. This just made me grin like a fool. 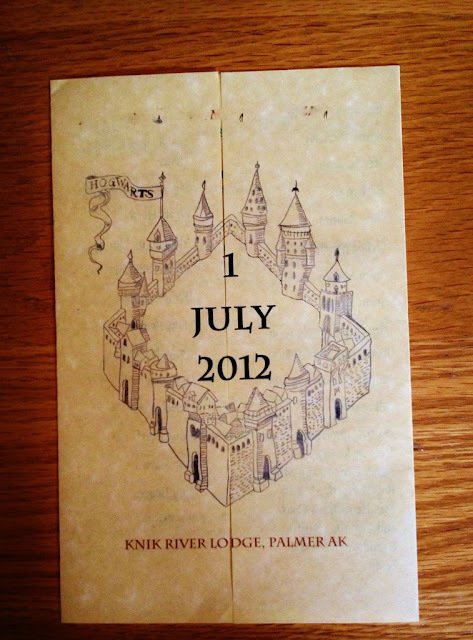 I am totally doing a Harry Potter wedding! 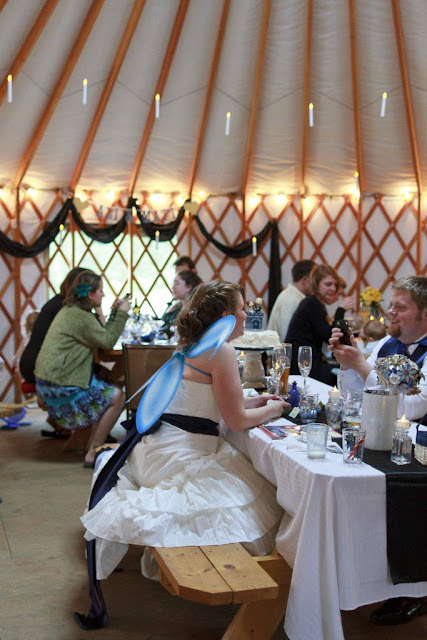 For more pics and a the story behind the other sci-fi and firefly themed wedding check out my other favorite website (after epbot and cakewrecks of course)Offbeat Bride. 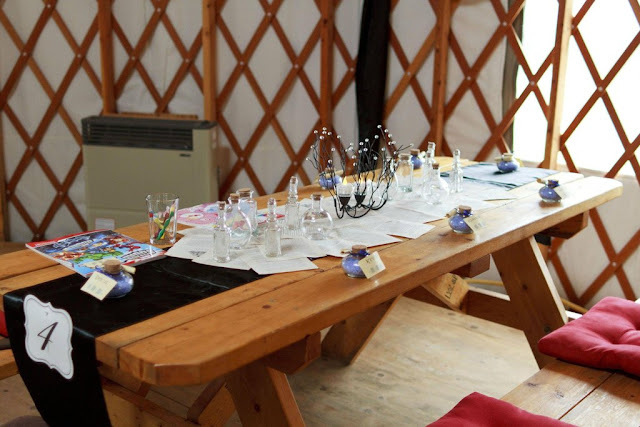 They have steampunk weddings and tons of geeky and punky and just awesome goodness. The whole offbeat empire is awesome, and i think you'd like it Jen. Just tell yourself that the pages are from copies so well-loved that they were falling apart and chunks had fallen out so that's really all they were good for. Like, um, my family's copy of Chamber of Secrets. @ Alison - the dice aren't a HP thing; I think the couple just also enjoys gaming. All the groomsmen wore D20 cufflinks, too, so it looks like the dice were just a fun add-in. Does anyone know where they got the cake topper? It's one of the best I've seen! Too bad my husband is a Muggle. I would have loved this wedding! He just doesn't get Harry Potter! "Always." :') Ack!!! So adorable! Well done, fellow Ravenclaws! i freaking love their centerpieces!